Studies show that 65% of all people are Visual Learners (simply put, they gain more knowledge from images and graphics than they do from reading text or tables of information). Among your players (males 18-25 years old) that number grows to 83%. You've only got so much time to help your coaches and players identify and commit to memory the keys to beating your opponent - our GameBreak Scouting Dashboards present your scouting data in a Visual, Interactive platform that helps your team more quickly recognize and more effectively memorize your opponent's tendencies, strengths and weaknesses. Traditional film system reports contain lots of valuable information, but aren't built for Visual Learners. A single report can contain dozens of pages of tables and charts full of data - much of it insignificant when it comes to your weekly preparation. Information that makes a difference has to be searched for and pieced together still - a time consuming and daunting task for even the most data savvy coach. Scouting Dashboards package all of your film data into a single, interactive platform that is uniquely designed for Visual Learners. Coaches and players can instantly identify a team's every tendency, strength & weakness in any given situation. The visual design makes it easy see and commit to memory important situational information, and the interactive nature of a Scouting Dashboard means you have anything you need to know right at your fingertips. "Our dashboard was a tremendous asset to our championship run in 2013...our 3rd Down & Red Zone efficiency dramatically improved." When your film breakdown data is packaged into a Scouting Dashboard we use the visual cues of Size and Color to instantly tell the story of the data it contains. For each category of breakdown information (Formations, Personnel Groups, Coverages, Fronts, etc) the data is packaged into a grid showing all of the various observations noted during your film study (the image at the right shows the various formations employed by an opposing offense). Within each of these grids, Size is used to indicate the relative Strength of a Tendency. The bigger the box the stronger the tendency, the smaller the box the less likely it is to occur. Color is used to indicate Offensive Efficiency - a color scale that goes from Red (indicating very poor offensive performance) to Blue (indicating very good offensive performance). By combining these two dimensions you can instantly see not only what a team likes to do in a given situation, but also where their strengths and weaknesses lie - providing you with a roadmap of how to most effectively attack and exploit your opponent. Packaging your film data into a Scouting Dashboard allows your coaches and players to spend less time trying to figure out an opponent and more time focusing on the keys that truly matter. Scouting Dashboards are fully interactive - with just a click you'll be able to fully explore a team's every situational tendency from any angle you desire. You are no longer bound by the limitations of traditional film system reports (that constrain you to 2-Dimensional analysis) - you can instantly go where your coaching brain leads you. The dashboard shown below is a simple example of how our Scouting Dashboards work. Interact with it by clicking on any of the items shown in the Data Grids (ex: clicking on "10" in the Offensive Personnel grid will show you all of the various situations, formations, plays, etc. that this Big12 team ran from 10 Personnel); use the filters under the field to narrow your study (ex: move the Field Position slider to only show plays run in the Red Zone); and place your cursor over any item to view a pop-up window containing more information. Accessing our services couldn't be more easy. You've already done the hard part by breaking down film. You simply export your film breakdown data to an Excel file and submit that to us via our secure e-mail address. That's it. Within 1 hour you'll receive your Scouting Dashboard back. And if at any point you need assistance you can call us on our 24 hour hotline. ​We bring the same quality, expertise and proprietary processes that have made us a hit with NASA, Lockheed-Martin and Boeing to our more than 100 football clients nationwide at all levels of competition. 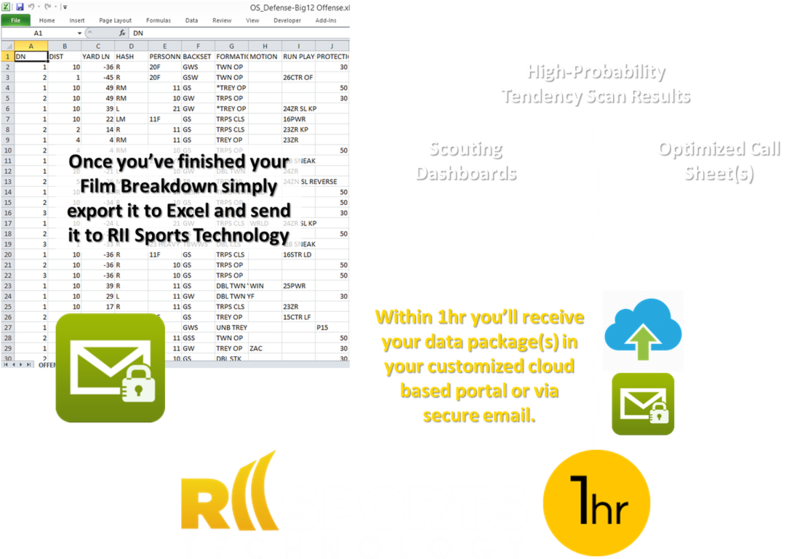 If you're interested in learning more, submit this form and we'll contact you directly to answer any questions you might have and discuss how RII Sports Technology's offerings can help your team. RII Sports Technology is a subsidiary of TTJ&B Inc. and has more than 15 years of experience providing data and analytical solutions to the Aerospace & Defense industry for organizations like NASA, the US Air Force, the US Missile Defense Agency, Lockheed Martin, and Boeing. We specialize in providing innovative, powerful & affordable data solutions.